Thinking you can’t indulge in your favorite rich and savory treats while maintaining a ketogenic state? Well, think again. Not only does this Keto Mousse fit perfectly within your keto macronutrient goals, but it only requires four ingredients and less than ten minutes of your day. Per serving, the macronutrients for this Keto Mousse are a total of 211 calories, including 20 grams of fat, two grams of protein and five grams of net carbs. 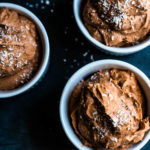 So what are the ingredients in this Keto Mousse that make it the ultimate low carb treat? The four ingredients of this dessert dish include organic full fat coconut cream, Monk Fruit Sweetener, unsweetened cacao powder and Lily’s dark chocolate baking chips. The particular sweetener used in this recipe, Monk Fruit sweetener, actually has some amazing health benefits. Believe it or not, Monk Fruit has the ability to lower the risk of diabetes, help maintain a healthy weight, fight free radical damage and possible harmful oxidative stress, decrease inflammation, fight fatigue and may even help prevent signs of cancer. This fruit actually contains up to 400 times the amount of sweetness of traditional cane sugar without any calories or blood sugar spike. The chocolate used in this recipe is sweetened by Stevia, another sweetener that provides key health benefits. Some of these benefits include a lack of blood sugar spike which is great news for individuals suffering from diabetes. Other key roles this sweetener plays is helping maintain healthy weight loss, improving blood pressure levels and improving cholesterol levels. Want a sweet treat that is not only low in carbs but high in health benefits? Try this Keto Mousse to satiate your sweet tooth while maintaining a ketogenic state. Pick up this short list of ingredients the next time you’re out shopping and start to see the benefits of this healthy dessert today. Meh- good texture but not sweet or chocolaty enough for me- just tasted like coconut cream. I made this with all the exact listed ingredients and thought it turned out pretty well. Texture wasn’t perfect mousse but I really enjoyed the flavor. This is coming from a guy who dislikes coconut actually. Thank you for posting this recipe. I did add a few extra dark chocolate chips sprinkled over mine 🙂 This is one of the tastier desserts I have had since starting Keto over 7 weeks ago.